This morning, I woke up and couldn’t get back to sleep because I was c-c-cold. Even though I was wrapped up, cocoon-like, in a fleece blanket beneath my sheet and light summer blanket, it wasn’t enough to keep out that October chill. Even though the weather’s not frigid by any means, it’s still cold enough to leave my poorly-insulated body shivering. I guess it’s time to break out the cold-weather comforter, eh? Needless to say, when I got up, I knew I wanted a nice warm breakfast to fill my tummy. Although the idea of eating another big bowl of Brownie Batter Oats was tempting, I had half a block of tofu in the fridge that was just begging to be used. So I decided to go with that vegan breakfast standby, tofu scramble. Nothing beats an old classic, right? On another note, it’s the first day of the first week of Project Feed Me! This week, Natalie is asking participants to purchase two cans of chili. I’ll be heading to the grocery store tomorrow to pick some up, and I encourage you to do the same. Check out this post for more info about the project and how you can help give back during MoFo. Thanks, guys! 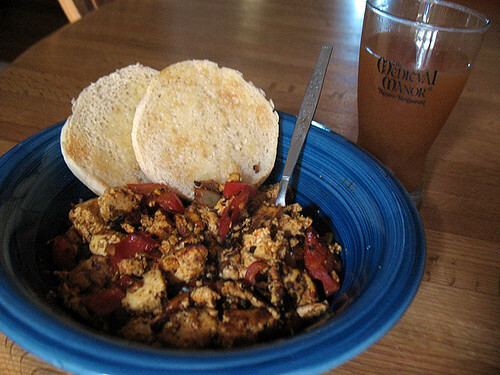 Yum- I love a tofu scramble! That looks so yummy! I keep eating these tiny vegan breakfasts, when in reality I want a huge bowl of tofu scramble too! They actually showed how they did it, and used footage from the webcams, showing kids who were clearly unaware.